Ella (Chen Jia Hua) from SHE has announced her pregnancy via Weibo. This entry was posted in > China, News, Weibo and tagged Chen Jia Hua, Ella Chen, Ella pregnant, Pregnant, SHE on October 24, 2016 by Kate - skimmedmilkdrama. July 5th is indeed a joyous day. We have heard the news of Michelle Chen’s marriage registration and pregnancy and now, wedding bells are ringing for Ruby Lin and Wallace Huo! This entry was posted in > China, > Taiwan, News, Weibo and tagged Dating, Huo Jian Hua, Marriage, Ruby Lin, Ruby Lin and Wallace Huo wedding, Ruby Lin Wallace Huo, The Glamorous Imperial Concubine, Wallace Huo on July 5, 2016 by Kate - skimmedmilkdrama. From reel to real. Yang Guo and Xiao Long Nu from The Romance of the Condor Heroes are now married. As an added bonus, they have a baby coming along the way! This entry was posted in > China, > Taiwan, News, Weibo and tagged Chen Xiao, Chen Xiao Michelle Chen Dating, Chen Xiao Michelle Chen married, Chen Yanxi, Marriage, Michelle Chen, Michelle Chen Pregnant, The Romance of the Condor Heroes, Yang Guo and XiaoLongNu on July 5, 2016 by Kate - skimmedmilkdrama. This entry was posted in > China, News, Weibo and tagged Betty Sun, 芈月传, Legend of Mi Yue, Legend of Zhen Huan, Sun Li on December 23, 2015 by Kate - skimmedmilkdrama. Happy belated Singles Day! Singles Day is celebrated on 11/11 every year in China because the amount of ‘1’s in 11/11 is like an amass of singles. It’s a big thing in China and promotions and sales on Taobao, China’s biggest online shopping retailer went through the roof on Single’s Day. Vic Chou: Mrs Zhou is so beautiful! Yes, we are married. Thanks, friends, for all the blessings. But this Singles Day, it’s special. 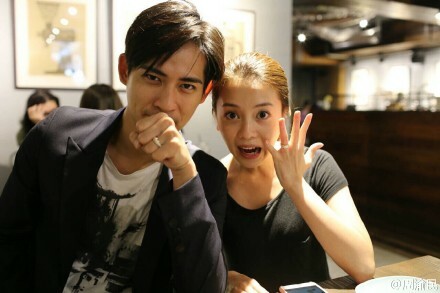 Vic Chou (Zhou Yumin), affectionately known as Zai Zai, had announced his marriage through Weibo on the eve of Singles Day, crushing the hearts of millions. Vic Zhou is married to his long-time girlfriend, Reen Yu (Yu Hong Yuan). This entry was posted in > Taiwan, News, Weibo and tagged Aaron Yan, Barbie Hsu, Black and White, F4, Love Buffet, Marriage, Reen Yu, Vic Chou, Vic Zhou, Yu Hongyuan, Zai Zai, Zhou Yumin on November 13, 2015 by Kate - skimmedmilkdrama.